Advanced peptides, Retinyl Palmitate, Jojoba Oil, Vitamins A & E.
Advanced peptides - Clinical tests revealed after 2 months of use, the surface area occupied by deep wrinkles was reduced by up to 45%. Retinyl palmitate - A skin restoring combination of retinol (Vitamin A) and palmitic acid. Jojoba oil - A plant oil that�s a rich source of numerous fatty acids, providing topical skin-soothing benefits. Water/Eau, Aloe Barbadensis Leaf Juice, Stearic Acid, Glycine Soja (Soybean) Oil, Sorbitol, Isopropyl Palmitate, Glycerin, Butylene Glycol, Carbomer, Polysorbate 20, Palmitoyl Oligopeptide, Palmitoyl Tetrapeptide-7, Cetyl Alcohol, Simmondsia Chinensis (Jojoba) Seed Oil, Parfum*, Beeswax, Lanolin Alcohol, Allantoin, Lecithin, Retinyl Palmitate, Tocopheryl Acetate, Phenoxyethanol, Caprylyl Glycol, Sodium Hydroxide. 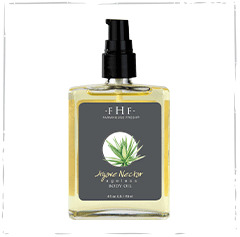 *All FarmHouse Fresh fragrances are phthalate-free. Contains Retinyl palmitate. In daytime, always use an SPF moisturizer, as retinoids are negatively affected by the sun. If you are pregnant, breastfeeding, or trying to conceive, contact your doctor before using this product. Massage a small amount into hands and body after bathing. 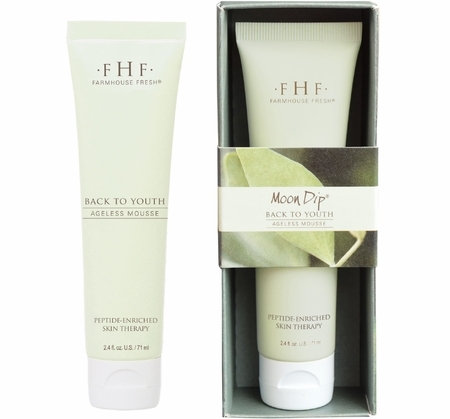 Peptides provide visible reduction in the look of wrinkles with twice daily use. This lotion smells amazing and does not leave your hands feeling greasy. 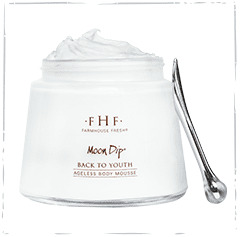 Absolutely love the moon dip hand cream. It's a super light wonderful scent that I can use as a massage therapist and not be offensive to clients while keeping my winter hands moisturized.